Now that Nintendo has removed the fire hopping advantage from Mario Kart 8 Deluxe, there’s a different high-level technique players need to master: soft drifting. The only problem? Soft drifting is much harder to pull off in Deluxe than it was in Mario Kart 8. There are two types of drifting in Mario Kart 8 Deluxe: the basic drift and the soft drift. In Deluxe, basic drifting still works the same way as in every other Mario Kart. You hit the jump button, then tap the joystick either to the left or to the right. This will make your car drift left or right, respectively. If you perform this trick successfully, you’ll see blue sparks start to fly out of your racer’s tires. If you drift for a little longer, the blue sparks turn orange-red. When you exit a drift, you’ll get a brief surge of speed. If the drift has charged long enough to turn orange, that surge will last ever-so-slightly longer. That post-drifting speed surge is called a mini-turbo. Mario Kart 8 Deluxe has introduced a couple changes to how drifting works, the most noticeable being mini-turbo boosts now turn from blue to orange to magenta if you wait long enough. The length of each of these mini-turbo boosts varies from kart to kart, and it’s affected by a hidden mini-turbo statistic that you can only find out more about if you use fan-made Mario Kart kart-building tools. But the simple explanation is, in order to get through a Mario Kart track as fast as possible, you want to drift as often as you can, and if you can charge the drift long enough to get the purple sparks, that’s all the better. That’s where soft drifting comes in. 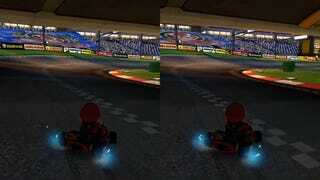 In Mario Kart 8, soft drifting was pretty easy to do. Instead of pushing the joystick directly left or directly right, the player would have to press the joystick to the upper left or the upper right at a 45 degree angle. This allows the kart to drift at a more gentle angle than the normal drift, but most important of all, it charges the mini-turbo boost faster. Why not use the soft drift technique for every single turn in the game, then, since it charges up to purple sparks faster? For one thing, it’s not possible to maintain the fastest possible racing trajectory if you only use soft drifting. Using the normal drift on wider turns will speed up your trajectory in the long run, and those long, wide turns give you enough time to charge up to purple sparks anyway. Any time you’re coming up on a gentle turn, though, you should use a soft drift. When Mario Kart 8 Deluxe came out, some players mistakenly believed that Nintendo had removed soft drifting from the game because the technique no longer worked in the same way. Hitting an exact 45 degree angle no longer resulted in a drift. 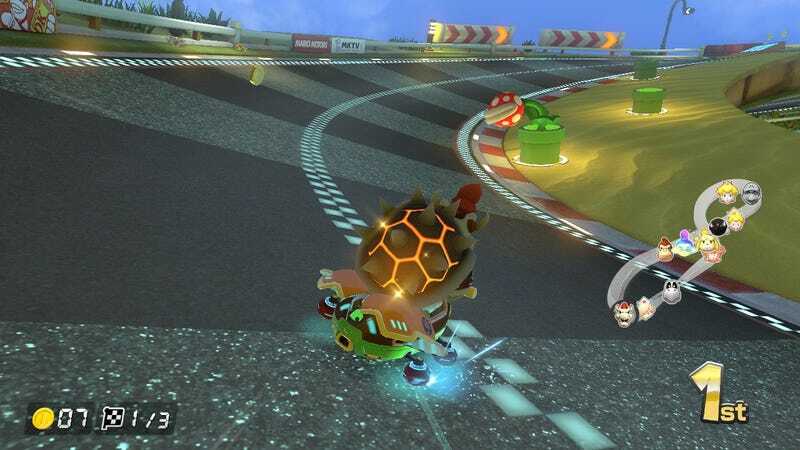 In the MK8 days, that angle was so exact that players could use controllers with octagonal gates in order to ensure that they were pressing the joystick in just the right spot, or they could press the up and directional buttons on the D-pad for the same effect. Those methods don’t work anymore, because in Deluxe, the soft drifting angle has changed. Even worse, the angle has changed from kart to kart. So go get out your protractor! The new angle now falls somewhere between 45 degrees and 90 degrees (pressing straight up on the joystick). In the Pipe Frame kart, for example, a 75 degree angle feels about right. You can find that sweet spot by hopping, pressing straight up on the joystick, and tapping it ever so slightly down the edge of the joystick gate until the drift sparks start to fly. Eventually, muscle memory will kick in and you’ll get a sense of the right place to hit every time, without having to keep tapping until you get it. Unfortunately, that angle could change depending on which build you prefer. Inside racing bikes, which already have a different drifting trajectory as it is, also have a different angle on the joystick for enacting a soft drift. That angle feels closer to 55 degrees. Because of the muscle memory required to do all of this, it’s all the more important that you finalize your Mario Kart racer build and practice with that build in order to ensure you’ve mastered your drifting angle. The good news? Since fire hopping still doesn’t work and no other similar technique been discovered to take its place, soft drifting is the only high-level tech left to perfect... for now, anyway.